Next on our list of surprise, surprise Asia Exclusives turned Toys R Us exclusives is Springer, the first of the Autobot Triple Changers. When I was a kid and I saw TRIPLE Changer, I was agog. Transformers with 3 modes??!! NO. WAY. Sure enough, Bot-mode, Alt-mode, Alt-mode. My 9 year old mind was blown. The Decepticons got a leg up on the Autobots; their Triple Changers hitting in '85 with Blitzwing and Astrotrain. The Autobots didn't get up to speed unril '86 when we finally got Springer, Broadside, and Sandstorm. HA! Autobots 3, Decepticons 2. Wait... Octane? Well... now we're even. Blitzwing was just cool, a flying tank-bot. Out of the Autobots, Springer was clearly my favorite. So how does Transformers Generations Springer match up to his predecessors? Check it out after the... jump. Jump? Springer? I see what I did there. Par for the course, Springer comes packed in the red Transformers Generations card with the bilingual text, again, English and Chinese. From the Bio we see that Generations Springer is indeed based on G1 Springer. Springer is the archetypal hero. Always at the forefront of combat with a confidence borderlining on cocky but with the skill to back it up. Springer was one of my favorite new characters introduced in the '86 movie. Sadly, I never owned an original Springer figure. Once again... rip open card... plastic tray, paper ties, instructions underneath. Nothing new here. Even though, historically, Springer is a Triple Changer, the toys we've received over the past few years have all only had the one Alt-mode. I'm guessing they didn't want to pay for the extra engineering. The Alt-modes were one of Springer's previous Triple Changer Alt-modes... one being a repaint of Energon Hotshot's armored car Alt-mode and the other being Cybertron Evac's helicopter Alt-mode. Both were okay, explaining away the third mode as Springer needing more power and losing an Alt-mode to gain it. Unfortunately, Generations Springer follows in the same vein, one Alt-mode. Springer is a repaint of the Transformers Hunt for the Decepticons Tomahawk... with a new G1 accurate head of course. The mold has only been used 2 other times, the Japanese Dark of the Moon Vortex and the Botcon 2012 Timelines exclusive, Spinister. Even though it's a singular Alt-mode, I do like the futuristic, gun-ship, helicopter mode. I certainly like this Alt-mode. Springer is primarily molded in grey. There is also some black bits with some dark green making up the underside of the Alt-mode, which becomes his Bot-mode legs. Most of the detail is done in some nice yellow paint apps that really throw back to the G1 figure, these are definitely colors that let you know this is Springer. On the Alt-mode wings is a very clean tampo of some stripes. 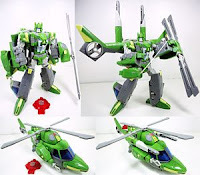 For accessories, Springer comes with 2 spring-loaded missile launchers and his signature weapon, a sword. The sword IS a separate item and not made from his copter blades. While the missile launchers fit snuggly under the wings in their posts, they do have the C-clips that will allow then to fit on a few other spots around the Alt and Bot modes. The sword really has no place to be set unless you remove one of the launchers and peg it in there. Springer's Bot-mode... leaves a little to be desired. The helicopter tail splits and folds to create the arms leaving some pretty big hunks of kibble. I don't like his feet... not at all. Springer should have feet, feet. These may in some way lend to his namesake, being all piston and hydraulic looking, making it sound like he can jump REALLY far, but I just don't like them. If this mold was used to make Whirl, I'd be okay with it, but not for Springer. I just feel like he should be more bulky. The rotor for the helicopter is no longer Springer's sword. For this incarnation, it just hangs off his back. You can do one of two things, spin it and set it as a vertical cross or 'X', or it can be rotated in half and left to hang. I prefer the vertical cross, it just looks cleaner and really doesn't interfere with the rest of the figures bits or movement. What makes this mold most notably Springer, is of course the new head sculpt. We get a very nice homage to G1 Springer. The ridges and the crest along with the vent openings on either side of the lower half of the face are definitely key features for Springer, well done. What I did notice, after mentioning this in my Wheelie review, is that Springer's eyes are light piped! Both Swerve and Wheelie lack this, but for whatever reason, Takara light-piped Springer. It makes me wonder about Cliffjumper... we'll look at him a little later. Thanks to the new engineers who've been giving us some pretty nice product over the past few years, Springer is mostly ball joints and a few hinges. His enormous feet provide a good base for him and allow him to hold a myriad of poses. Earlier I mentioned that I never owned an original Springer; he's always one of the figures I look at buying when I see one. I'm horribly picky though and want my figures near mint at least with intact stickers and it's really hard to find a G1 Springer that's up to my standards that won't cost me and arm and a leg. The first Springer I actually owned was FansProjects Defender Warbot, and he's a beauty. Die-cast construction (it's a lost art), plenty of joints, and an array of weapons that store well in all modes... he's fantastic. All in all, for a mold that I'm not super keen on, I do like having a 'Classics' Springer. Of course I'd prefer to have a Has/Tak Triple Changer that would more than likely cost me a fraction of what I paid for Warbot, but I'll make due. To reiterate from Swerve and Wheelie, if you like Asia or TRU exclusives, get Springer. If you like Springer, getting him is a no-brainer. So jump to it (did it again) and get your Springer. And now... I leave you with a picture of me meeting Neil Ross, the voice of G1 Springer at Botcon in 2011. You can be jealous now. I've got better things to do tonight than die! Uh, super jealous....that's awesome that you met him!! See, I just can't get on board with this mold. I love Defender-Springer so much because not only is he an accurate triple changer, but he's kind of beefy/bulky which is how Springer should be. This looks like Springer has an eating disorder. Again though, great review and its great to have clear, up close pictures of everything. I love Tomahawk, the original use of this mold, and I love the colours and the sword on this Springer.